We have been having a short walk every day and yesterday we did a bit of shopping at the local Tesco Express. (I know folk knock Tesco but we find it really convenient). Ray put these daffodils in the shopping trolley - for both of us I think! I had a little play with the illustration mode on my a6000. This is really lovely Hazel - particularly as they are one of my favourite flowers - spring is not far away. I really like your processing. Fav for me! Glad to see that things are on the up for you. How nice of Ray to do that! Love the mode you have used Hazel. It is always good to have some local shops to pop into I have a Spar round the corner always handy for milk. 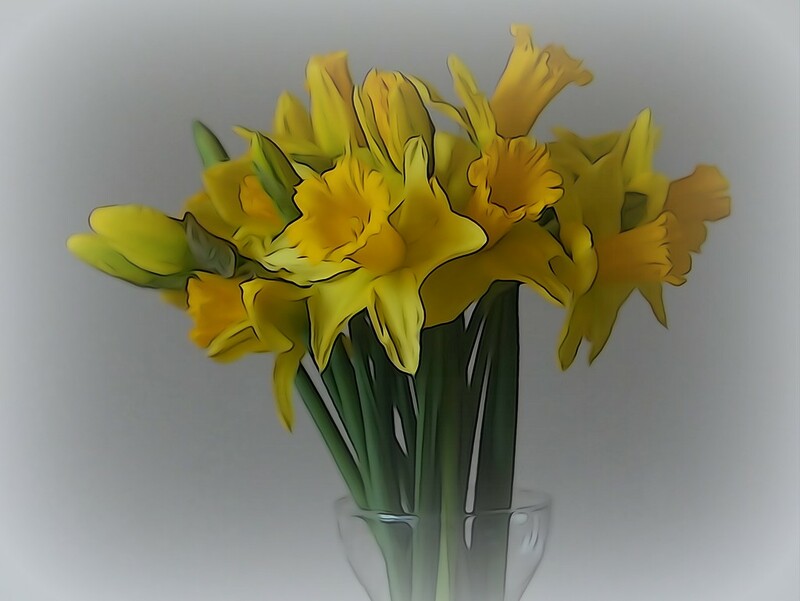 Love daffodils! And the editing is really fun here. Warm and wonderful edit. Daffodils equal spring and renewal. Ray has excellent ideas. An in-camera edit - works best for flowers I think! Oh nice, what lovely processing! Lovely promise of the coming ( I hope) spring. I now think I need a bunch of flowers too. It woz the camera wot done the scribble! Lovely bright & cheerful shot! Love how they have turned out Hazel.....the dark edges look special. I have no problem with Tesco, I like shopping there when I am up that way. Nearest one is 7 miles away so that’s not often which actuall makes it more interesting...it’s a big 24 hour one too! It gave it a painterly effect. I have to use iColorama app to get edges. Nice editing, I love the way they have turned out. This is so neat. I'm sure I have that setting on my a5000 but I haven't tried it. I love the way you processed this!